The Bead Head Breadcrust is one of the best caddis imitations ever fished. Rudy Sentiwany invented the original pattern back in the early 1940’s for the trout streams in the Pocono Mountains. Ed Rolka later popularized the pattern when he began tying it commercially. It quickly gained national notoriety when he tied it for the Orvis Company. In two different colors, red and gray phase, it can imitate free-living caddis, net spinners, and cased caddis. We recommend carrying it in sizes (#10-18) in both colors, with and without bead heads. The Bead Head Breadcrust is one of the best caddis imitations ever fished. Rudy Sentiwany invented the original pattern back in the early 1940’s for the trout streams in the Pocono Mountains. Ed Rolka later popularized the pattern when he began tying it commercially. It quickly gained national notoriety when he tied it for the Orvis Company. In two different colors, red and gray phase, it can imitate free-living caddis, net spinners, and cased caddis. We recommend carrying it in sizes (#12-18) in both colors, with and without bead heads. 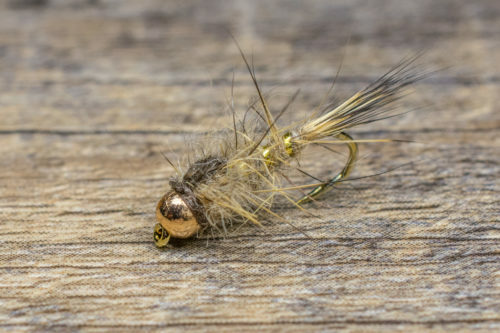 The Bead Head Breadcrust is a proven favorite anywhere cased-caddis are present. During April and May, you cannot go wrong fishing a two-fly rig consisting of a Bead-Head Breadcrust with a Sparkle Wing RS2 or a Mercury Pheasant Tail dropped below it. This tandem set up imitates both caddis and Baetis, two of the most important food sources during the spring season. We recommend fishing these patterns on the dead-drift but allow them flies to swing to imitate emerging pupa and Baetis nymphs. It’s never a bad idea to set the hook after the flies have swung (a position set) to see if a trout grabbed the fly on the rise. For quicker sink rates, we recommend the Tungsten Bead Head version.